With Spanish property prices down by 8.3% over 12 months to the end of June, Spain is in 10th place for annualised price declines according to the Global House Price Index just released by international real estate consultants Knight Frank. 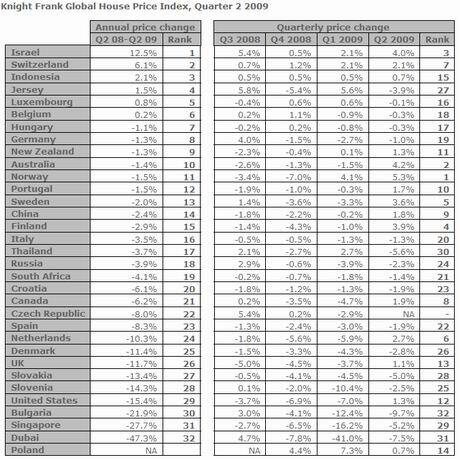 Of the 32 countries in the Knight Frank ranking, properties prices increased in just 6 of them in the last 12 months. Prices rose the most in Israel (+12.5%), followed by Switzerland (+6.1%) and Indonesia (+2.1%). At the other end of the scale, prices fell the most in Dubai (-47.3%), Singapore (-27.7%), Bulgaria (-21.9%), the US (-15.4%), Slovenia (-14.3%), Slovakia (-13.4%), and the UK (-11.7%). Ordered from highest to lowest, Spain was in position 23 out of 32, or 10th from the bottom, a better performance than countries like Holland, Denmark, the UK, and the US. That begs the question, why are property prices are holding up better in Spain than these countries? A clue to the answer is that the Knight Frank index is “compiled using official government statistical office or central bank data where possible”. If Knight Frank are using official statistics for Spain, then their ranking is misleading as far as Spain is concerned. Transaction prices in Spain – the price at which property actually sells – are almost certainly down more than 8.3% in Spain. Assuming the data used for other countries is more reliable, the good news from the index is that Global property markets may be showing signs of bottoming out. On a quarterly basis prices rose in almost half the countries included in the index, with prices up by 5.3% in Norway, but down by 9.7% in Bulgaria. But it may be too soon to break out the Champagne. 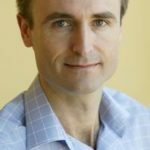 “Further falls are always a possibility while credit flows remain constrained and the global economy struggles to recover from recession, but it does appear that the worst is behind us,” warns Liam Bailey, head of residential research at Knight Frank.